Toshiko Kasen telling Toni Cipriani that she wants her husband's money burning in the streets of Staunton Island for everyone to see. 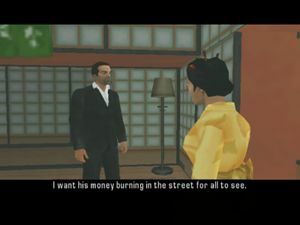 Cash Clash is a mission in Grand Theft Auto: Liberty City Stories given to protagonist Toni Cipriani by Toshiko Kasen, the wife of Yakuza leader Kazuki Kasen, from her apartment in Torrington, Staunton Island, Liberty City. Toshiko informs Toni that disrupting the weapons shipment has infuriated her husband. She now wants Toni to destroy some money he is moving from his casino stored in vans, which Toni relucantly agrees to do, as he had ideas for the money. Toni drives to the three vans locations, destroying them using a rocket launcher. Toshiko Kasen: Mr. Toni. My husband was greatly infuriated by your actions. You have made him, and his men, look like the fools they are. Toni Cipriani: I aim to please. What's next princess? Toshiko Kasen: My husband is moving a great quantity of cash from his Casino. I want you to destroy all of that money. Toni Cipriani: I can find a damn good use for that money, sweetheart. Toshiko Kasen: I want his money burning in the street for all to see. Toni Cipriani: Okay... okay... when's this move gonna happen? Toshiko Kasen: It has already begun. They're leaving the casino right now, so please, you don't have much time. The reward for completing the mission is $3,000 and the A Date With Death mission. One of the Securicars carrying Kazuki Kasen'd money. Toni Cipriani trying to locate the three Securicars carrying Kazuki Kasen's money. Toni Cipriani destroying one of the Securicars. Toni Cipriani destroying the last of the Securicars. This page was last modified on 9 May 2015, at 04:58.